Summer time is finally here and that means camping and grilling outdoors. Compact and easy meals are always our favorite so we have more time to spend together. We've prepared these at home and frozen them, then packed them in the RV. Put in the refrigerator on the morning you want to serve them and pop onto the coals about 30 minutes before you want to eat. It's also a fun activity with young ones. Line them up at the picnic table and set them to packin' the onions. 1. Peel your onions and cut them in half. 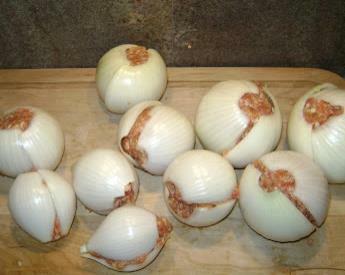 If the onion is large it's sometimes possible to cut down only one side of the onion and have full circles to stuff. 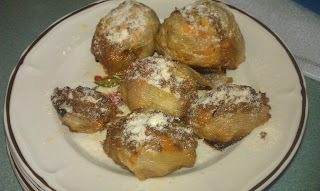 Lay a slice of cheese in the onion cup or add some grated cheese to the ground meat. 3. Size your meatballs so that they can be squished between two pieces of onions. Some meat will push out the ends and that is okay. Just make them as compact as possible. 4. Wrap each onion bomb in tinfoil-- either double them or use heavy duty foil since they'll be tossed in the fire. Use tongs not a fork so you don't poke holes in the foil. 5. Toss in the fire and try to get them in the coals. 6. Cook for about 10 minutes, flip "em around and cook another 10 minutes or so. I've also made these in the oven on 375 degrees for about 30 minutes. They make the whole house smell delicious. Set atop a layer of tomato sauce they have a nice presentation. Great idea, I had never seen this before. When you freeze then, do you freeze them cooked or uncooked? You can freeze them uncooked but make sure they're mostly defrosted before popping on the grill.